Cadmium, Lead Nickel Free! 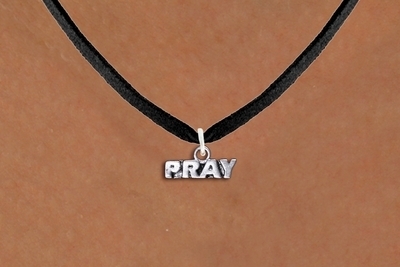 Silver Tone "PRAY" Charm Comes On A Black Suede Leatherette Necklace. Charm Measures: 1/4"h x 3/4"w. Leatherette length 18" ** About Feedback** We maintain high standards of excellence and strive for 100% customer satisfaction! Feedback is very important to us. We request that you contact us immediately BEFORE you give us neutral or negative feedback, so that we can satisfactorily address your concerns. It is impossible to address issues if we do not know about them!